WE COMBINE SHIPPING within the US - MAKE SURE TO LOOK AT ALL OF MY CURRENT AUCTIONS FOR SIMILAR TITLES! PLEASE read everything below - Feel free to e-mail with questions before the end of the auction! PEARL JAM - 1990-1992 Boxed Set Sampler Promo Set (Epic 2009). SME-PJPRO-7. This just could be the holy grail of Pearl Jam vinyl collectables. Only 200 of these sets exist. This is the large center hole version, and this set is not boxed - they were issued individually. 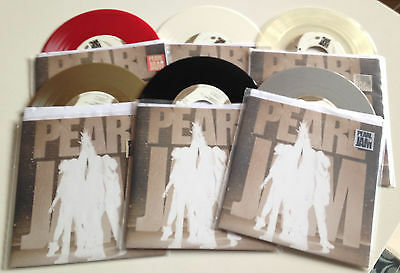 According to Discogs, "This set of six multicolored 7" vinyl singles were pressed to promote the Ten Super Deluxe Edition, but never released to the public. They were produced as a thank-you to those who worked on and made the 1990-1992 Boxed Set happen, but for unknown reasons, they were never distributed. Each copy includes a clear plastic sleeve with a colored sticker that corresponds to the colour of the vinyl inside. Each copy contains the same tracks, the only difference from one record to the next are the colours of the records. Limited To 200 Sets; 100 small hole cut, and 100 large hole cut. An unknown quantity of boxes were made for the set, it is thought that there are less than 200 as the boxes that were made for the set are very difficult to come by. Side B is double-grooved with a hidden track, It Ain't Like That, which is Pearl Jam covering part of an Alice In Chains song followed by Eddie Vedder saying "Hello, this is Abe Vigoda and I just want to say that Alice In Chains rocks my world!" You can also see more info at the PJCollectors website: http://www.pjcollectors.com/detail.asp?id=1984. Each record has the same sleeve art & track listing. Each bag holding each record has a sticker on it indicating the color of the vinyl therein. This collection originates from a collection in New York City. Well known dealer Record Mecca sold a copy of the black vinyl 7"-only back in 2011 for approximately $500. That is the only previous example of a sale I could find in researching this set. This is a genuine & authentic pressing by Epic/Legacy. Please do not hesitate to contact me with any questions. Please e-mail with any questions prior to the end of the auction. I'm happy to combine shipping. Thanks for having a look! Unless otherwise stated, all vinyl is VISUALLY graded. Due to the amount of records I list, it's impossible to actually listen to everything. Unless marked as new, these are used records and all that might include - possible surface noise, pops, etc. Please keep this in mind when bidding. I do my best to grade conservatively & thoroughly. If you're looking at this on a phone, I suggest waiting until you can look at the photos on a large screen. *** ATTN: International bidders (i.e. outside the USA) - I ship with eBay's Global Shipping Program. I am UNABLE to combine shipping. Please e-mail with any questions prior to the end of the auction. I'm happy to combine shipping (generally $1.00 per extra item) when shipping within the United States. Thanks for having a look!